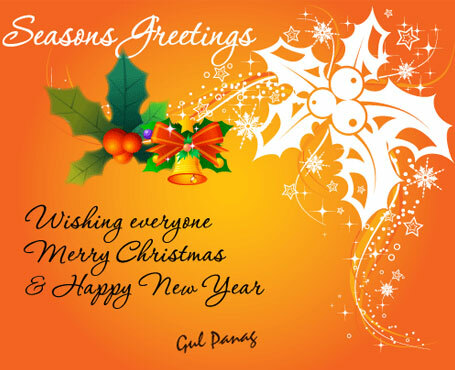 Merry Christmas and A Happy New Year Gul ! Hope you’re well!! A very merry christmas to you! Hope you’ll have fun! I watched Summer of 2007 recently, your act was ‘impactful’. Good luck for next year, hope to see a lot more of your work. A very Merry Christmas and Happy New Year to you and yours as well. I wish a Very happy Christmas with love and joy. I hope that Santa will shower peace and prosperity alongwith yummy cookies for all of us. Santa wishes that this Christmas we take a pledge to spread Happiness,peace and friendship to all like flurries of snow evenly. What would you like to recommend Indian people on happiness. i am researcher on happiness and work with many insitutions and people from challenging background for their positive well being.i would like to understand your point of view too. Hey, Merry Christmas. First time here. Nice place you have here. Will frequent more often. Btw! Haruki Murakami’s Wild Sheep Chase, that’s one of my all time favorite books too… I love his crisp style of writing! Thank you Gul for your wishes. The year 2008 has been really great for you as I know career-wise when compared to 2007. I wish you all success in all your forth coming projects and may God shower his blessings on you for good health and happiness throughout your life and may you reach great heights of achievements both personally and professionally. Have a wonderful New Year. Growing up, I remember, everyone use to criticize westernization. It was said that the value system will get destroyed and so on. But something opposite seems to have happened. The people have become more sort of sober. There are more smiles and thankyous around. Whats so worng in being liberal. All of us here are celebrating christmas and blessings that it brings. A hundred years ago it would have been taboo. Gul, there is something spiritual about your forum too. we feel connected to someone we dearly admire. :Belated Merry Christmas and have a fabulous New Year”! Watched Manorama – Six Feet Under again yesterday. You look completely different as a down to earth housewife. A belated Christmas, hope u guys had a great time!and Wish You all the best of a HAPPY HOLY and PROPEROUS JOYFUL NEW YEAR! Stay Healthy , Stay Good and Keep Smiling! Gul : Am wishing u scale great heights wrt ur career, Hope to see you doing better than U had ever! God Bless U and Ur family. Take care and Keep ur smile on. Wish you the same and great year ahead! Wish you a very very Happy New Year. Nice to see you in Tata Sky advertisment with Aamir. Gul we haven’t seen you after the power packed performance of Dor. Just out of curiousity when we will be able to see you on screen. in contiuation to my previous post. I wrote we haven’t seen you after power packed performance of Dor. A happy and peaceful new year to you as well! You really do look very nice in the Tata Sky ad with Aamir. I also like you in the climate change film on YouTube – it’s a very nice film with an important message. Wish there were other celebrities like you, who appeared in films of similar nature. I have gone through most of the articles, which I must say are very well written and well thought. gul..a copied poem, but gud one….for u sissy!!!!! But, the movie surely has made me your fan. I really liked your character in Dor. You know what, you should use http://twitter.com, a micro blogging service. It is awesome and followers keep in touch with you real time. I just read “the 50 celebs on twitter” and it’s like Britney Spears, Demi Moore, Lance Armstrong, Michael Phelps and all communicating with their fans and friends. Awesome do check it out 🙂 You can use this space whenever you have ample time and write an article. Have started twittering! Thanks !! bright blossom in my life. giving me lots of sunshine. for everything you’ve done for me. I hope your day is beautiful and sunny.